Any City Hallers would know this porridge restaurant that has been on a number of City Hall episodes. How can one forget how Jo Guk tried hard not to cry while eating his porridge and looking at Mayor Shin Mi Rae’s photo? What I love most in this shop is that they preserved the props used in the drama – the tarpaulin with Shin Mi Rae’s photo even if it has been 3 years already. They also proudly display some more photos from the drama inside and outside the shop. There’s even a nice signage that reads “City Hall Filming Location” outside. 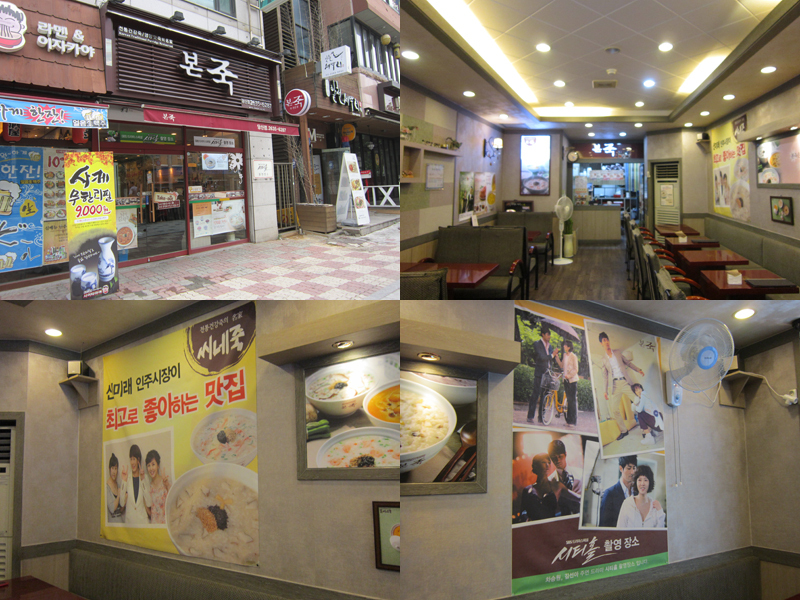 Whereas some of Kim Sun Ah’s filming drama locations have either renovated their place already or have taken down photos from her dramas. Take line 9. Get off 당산 station. Take exit 8. Walk straight ahead. You’ll find the porridge shop on your left. Alright, there were actually no scenes that was ‘really’ filmed inside (or even outside) the National Assembly, I believe. 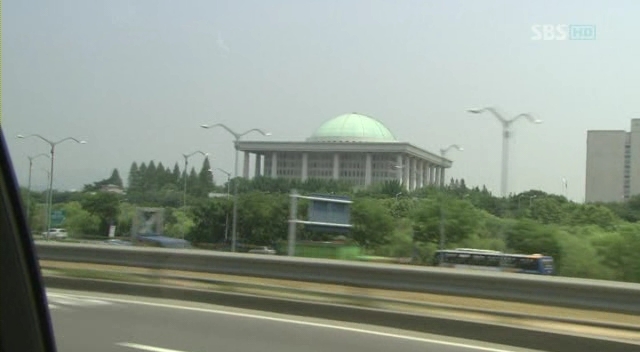 Just a POV of Jo Guk from his car and some studio-filmed scenes that was supposed to be the inside of the National Assembly (unless they really filmed it inside?). 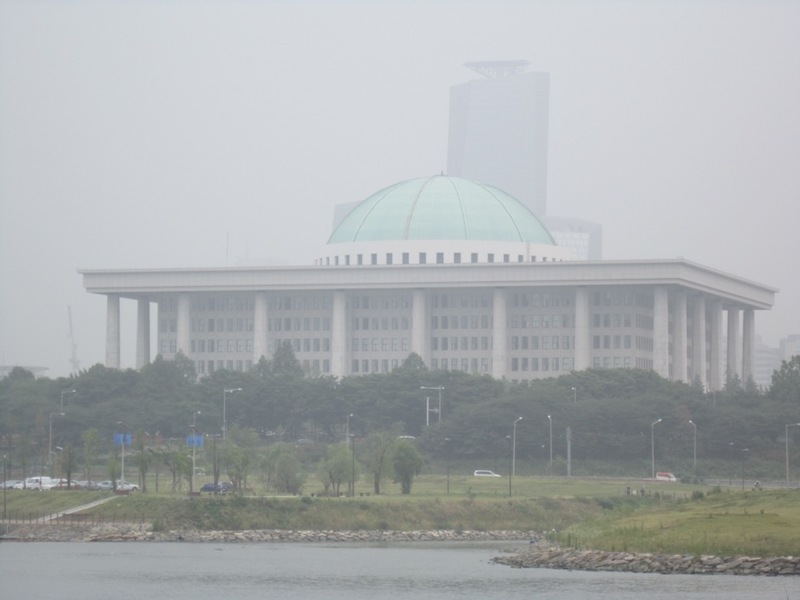 Nonetheless, for Kim Sun Ah / City Hall fans (fondly called Cityhallers), the National Assembly = Congressman Jo Guk! 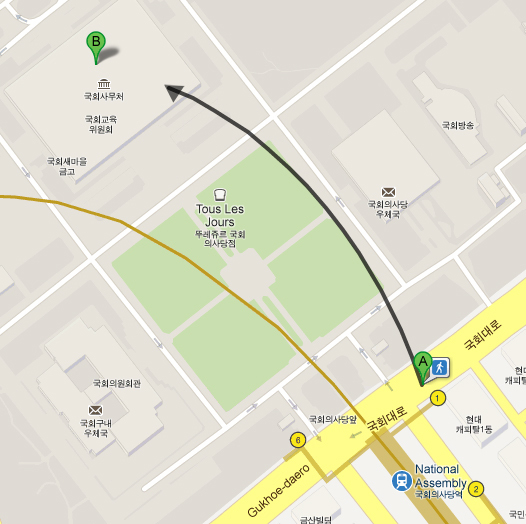 Take Line 9 and get off 국회의사당 station Exit 1. ME 2: What’s so good about the morning. Did you forget what day it is today? ME 1: Don’t start! Did you know how depressed I was last night? I’m glad I was able to get over my depression after a good night sleep, and now you’re ruining my mood again! ME 2: Sorry, but I’m still not over last night’s episode. And I’m so scared about tonight’s episode. ME 1: Alright, that’s it! My mood’s ruin! Happy now? ME 2: Are we… really gonna watch it tonight? ME 1: We’ve seen it from episode 1 – no fail! And you’re telling me to skip the final episode? The FINAL episode! Of all episodes! ME 2: You don’t have to point out that it’s the FINAL episode! Besides we missed Episode 3, right? ME 1: Well, that one’s forgiveable, given the circumstances. Besides, we were still able to 본방사수 the first few minutes, right? So it’s still counted. ME 2: Still, can we just not watch it? ME 1: And what? Pretend that the drama didn’t finish and wait for it next weekend? Are you joking? ME 2: Among all of Suna Unnie’s dramas… Why is this drama too difficult to watch? ME 1: I’d say, among all Kdramas! ME 2: Well, I don’t watch other Kdramas – unless Suna Unnie’s on it. ME 1: Alright, I watch other Kdramas too… but I don’t 본방사수 them. ME 2: Would Yeon Jae die? ME 1: I guess that’s what making this drama the most difficult drama to watch. As if bidding the drama goodbye is not sad enough, we also have to deal of what would happen with the character that we learned to love so much. ME 2: You didn’t answer my question. ME 1: Because I don’t know! Ask writer Noh! ME 2: Alright, let me rephrase. Would you like Yeon Jae to die? ME 2: Ey….! I knew it, you have a stone for your heart! ME 1: Well, I’ve been very vocal right from the start that I want her to die. End of story. ME 2: You are sooo mean! A mean masocist! ME 1: I guess I am then. ME 2: I don’t want her to die. Why did they make her character so loveable and why did they make YJ and JW so happy, then kill YJ at the end? That is just plain torture and cruelty. ME 1: Life is cruel! ME 2: I’m watching a drama, not life! ME 1: Let me remind you that the reason why you are this addicted to Korean dramas is because you find it so different from the dramas produced in your own country. And for the first time you get to see the point of your professors in the Film Institute in your university through Korean dramas. ME 2: Oh, that was a loong time ago! I can’t remember it anymore! I want a happy ending. ME 2: So what? Besides, even if they give us a happy ending, I still won’t be completely happy. The fact that the drama is ending is already making me so sad. ME 1: So, just because you don’t want to be sad, you want a fairytale-like ending to ruin this drama that has been so awesome right from the start? That is selfish! So very selfish! ME 2: Don’t you know that a lot of viewers wishes for the same thing? ME 1: Then all of you are selfish! ME 1: No, I’m not! I’m as sad and scared as you are! I crie with you last night, don’t you remember? ME 2: So why not join us in prayers so that YJ will live. ME 1: I don’t want a fairytale! Walt Disney has produced a lot of it. I could easily chose from one of them if I want to. Oh, why would I have to bother with Walt Disney? I have City Hall here. ME 2: Why can’t it be just like City Hall? ME 2: City Hall is awesome! I bet you’ll agree! ME 1: Yes it is awesome! ME 2: And you love it to death! ME 1: Yes, I love it to death! ME 2: So, what’s your problem? If you love City Hall to death – with it’s “fairytale ending”, then why don’t you want a similar one in SOAW? ME 1: City Hall and SOAW are different! They have a different premise. City Hall’s message is way different from SOAW’s point. ME 2: They are all Korean dramas for me. ME 1: I just want a meaningful ending, that’s all. The drama has instilled a lot of life’s lesson over the course of 15 episodes. I won’t forgive the writer if everything that they are trying to point out would all go down the drain simply because viewers wanted a happy ending. If I were to make a wish though, I just wish that SOAW will not end tonight. ME 2: How dare you call me selfish earlier? That’s a very selfish wish! Don’t you know how difficult it was for Suna Unnie. She deserves a good rest. ME 1: I know, but I am just so in love with this drama. I still can’t believe it’s ending tonight. ME 2: Well, me neither. Sigh… I really just want YJ and JW to be happy! ME 1: YOU want to be happy! ME 2: Yes, I want to be happy. So what? ME 1: Sigh… It’s useless talking to you! ME 2: I can dream, can’t I? ME 1: You can dream that Suna Unnie and Dong Wook would date in real life. And with that, I’m with you! ME 2: That made me feell better, thank you! ME 1: So does that mean we are gonna watch it tonight? ME 3: Both of you are making me crazy! Why don’t you just shut up, eat breakfast and do the things you need to do today, so that you’ll be comfortable watching it tonight. Get your tissues ready and prepare your hearts to say goodbye to the drama. Whether YJ will live or not, all I’m after is a good execution. If YJ will live, a lot of people would be happy, and I guess I’m pretty with that as long as they still get to clearly point out their message about life and death. If YJ would die, a lot of people may be sad, but again, as long as they get their message across, then that wouldn’t be so bad. ME 4: I can’t understand the three of you… I’m just gonna watch WALL-E today. Less complicated! It’s official! This drama made me nuts! Would anyone be kind enough to bring me to the psychiatric ward after tonight’s episode? I’ve been a member of a subbing team since 2007. That time I was already starting to learn Korean. I used to watch Korean dramas in bootleg DVDs before. But as I learn the language I get more and more frustrated to the incorrect subs. Back in 2007 there was a good drama I’m watching (H.I.T.) whose theme is too complicated to be understood in gibberish English subs. There was a subbing team, D-Fansubs, who was doing the fansub for that drama but there was no progress. I decided to join them in the hopes that I can help the subbing progress. That same year, B.O.N. Funsubs announced that they are subbing Kim Sun Ah’s comeback drama When It’s At Night. I was sooo excited to see our Samsoon back on television drama that I volunteered to join them right away. I started as a timer and eventually became a coordinator. I also coordinated City Hall (and was very happy and proud with our output) and also started coordinating I Am Legend (because it was supposed to be Kim Sun Ah’s – decided to continue with the project despite Kim Sun Ah’s quitting – but didn’t get to see it until the end (sorry guys!). I also time some episodes of some dramas here and there with B.O.N. I also sub some random Kim Sun Ah videos here and there – news, interviews, old dramas, etc. And now I’ve joined WithS2 as a timer for Suna Unnie’s new drama Scent Of A Woman. Others said it’s their way of “giving back”. I guess I can say that as well. Enjoying and loving lots and lots of Korean dramas over the years with free subtitles makes me feel grateful to everyone behind the gruesome process of subbing. As a way of “giving back” to the K-drama community, I want to give some of my time to help fellow subbers complete a project. But more than “giving back”, I think I sub because I want to bring Kim Sun Ah and her dramas closer to the audience that are non-Korean speakers. If a drama remains unsubbed, no one would bother watching it unless they understand Korean or they are so big a fan of a certain actor. But if a drama is subbed, more people would definitely watch it. And on top of that, it helps my Korean too. I learn a lot of new vocabularies, grammar patterns and expressions here and there. I also learn about the art of translation. And subbing helped my ears got used to the language too. Subbing along with unending dramas and loops and loops of Korean songs on my music players I became at ease in listening. That even if I still can’t understand a lot of words, I can determine the word and sentence boundaries. Thus I feel comfortable during listening exams (TOPIK or classroom). By the way, if there’s someone interested in joining us in WithS2 in subbing Scent Of A Woman, please leave a comment or e-mail me. We are still recruiting members for the drama. Thanks! I love 불안한 사랑. I like the singer (호란), I like the composer (노영심), I like the melody, I like the lyrics. I think it’s very poetic and very sad too. And I’ve memorized this song when City Hall was still airing. Here’s the song and the lyrics translation by our City Hall team in Bon Funsubs. There are some differences from CoreanBigSis’s translation. And it’s interesting to compare the two versions and analyze them. Translation really is a very difficult, tricky and artistic job. And I love it! Thanks to CoreanBigSis and to whoever requested the song! And to my City Hall team in Bon, I missed you guys~! Can I really fall in love with you? Why do I feel so anxious? I’m enjoying studying Korean Songs lately because it makes me retain more words and grammar pattern easily. As you all know, I’m totally clueless about K-pop but I’m somehow familiar with SG Wannabe since they’ve sung some of Kim Sun-Ah‘s drama OST – such as 우습지 in 밤이면 밤마다, and former member Chae Dong-Ha sung 웃어봐 in City Hall OST. I’m posting this in memory of Chae Dong-Ha. you came to me illuminated by a dazzling light. I know this is love. The one who helped me see the smile in my eyes. I’m thankful because you are the person beside me. I’m able to be happy. When it rains, I’ll be your umbrella. When it’s dark, I’ll be your light. When you are exhausted, remember our love. I’m not facing it alone; there are two of us. I’ll be fine as long as I have you. I’ll engrave your image on my eyes. Love is addicting, but not toxic. Non toxic. That’s what you are to me, no doubt. I didn’t know my love. 아니 내 두려움 뒤에 숨은 사랑을 못봤어 늘 바보처럼! No, like a fool, I couldn’t see this love that was hidden behind my fear. all these things, I got that. You’re my everything, all that I got. “I love you”, I’ll smile at these words. I’m able to breathe because of you. And that makes everything alright. “I love you”, I just need to remember these words. I promise it would only be with you. Happy 2nd Anniversary City Hall! Has it been two years? Wow! Time really flies! Actually I was a month late. The real anniversary of City Hall is April 29th.